The debate is valid: What is the proper role of the Coptic Orthodox Church in the nation’s politics? It is also an unavoidable debate. Once Pope Tawadros appeared with the Grand Sheikh of al-Azhar to back the popularly-backed military overthrow of President Morsi, he reasserted the church into the political scene. With the election of Abdel Fattah el-Sisi as president in June 2014, the Church has attempted to reestablish itself as the monolithic voice of Egypt’s Coptic community. But that role, too, carries risks. Rather than trying to unify Egypt’s Christians under its leadership, the Church should withdraw from the political sphere and allow Copts to defend their interests themselves by joining political parties and movements. The Church should focus on being an institution of civil society that defends universal ideals such as human rights and social justice, and on supporting developmental projects for both Muslims and Christians. In the essay which follows, Fahmi does an admirable job of summarizing the recent history of the Coptic Church in politics. Within a limited political sphere, President Mubarak allowed Pope Shenouda to represent the Coptic community outside the realm of law. After the revolution Pope Tawadros spoke against a political role for the church, but increasingly found himself drawn in during the Morsi administration. Famhi helps the reader track with an often neglected sub-theme in the Egyptian transition. But in his summary critique, he makes statements that do not completely gel with my understanding of the situation. Though the church does invest much charity in Christian focused projects, it also benefits local Muslims. Surely it could do more, of course. He recommends the church defend universal ideals, but would this not also be a form of political engagement? Perhaps his wording is poor, but is the church doing anything to disallow Christians from joining political parties and movements? The church has always presented its participation in the overthrow of Morsi and the backing of the roadmap as a national decision, not a political one. It backed the constitution and the presidential election, but did not back a specific candidate. Again, its decision to speak at all can be criticized, but the nature of its speaking does not represent an attempt “to reestablish itself as the monolithic voice of Egypt’s Coptic community,” as the author accuses. The Church’s support for the military’s 2013 intervention has given it a privileged position in the new regime, prompting the Church to try to revive the old pact it had with the Mubarak regime. And changes carried out by the state have helped the Church regain its position as the only representative of the Coptic community. As the new political authority has tightened its control over the public sphere, youth movements, including the Maspero Youth Union, have lost their ability to mobilize. Coptic politicians have also lost their influence, as the new regime seems to see little role for parties; President Sisi has not held any meetings with political parties. What sort of privilege does the author intend? Is the church any more privileged than the judiciary, or the police, or the administration, or other institutional bodies that backed the overthrow? And where is the evidence of the church’s intention to “revive the old pact”? One can guess at their internal desire, but the author confuses the conduct of the state with the approval of the church. The Maspero Youth Union lost its ability to mobilize long before the overthrow of Morsi. But it says that despite initial uncertainty it has a good relationship with the church. And within the political parties, Coptic politicians are still quite numerous and influential. Yes, the public sphere has shrunk, and political parties appear marginalized. Yes, the church has not spoken out against this, but few have. This is a national issue, and not one to lay at the foot of the church. In terms of discourse, the Church needs to differentiate between defending universal values in the public sphere and engagement in deals with the state or political parties. While the first is needed and would improve the Church’s public image among Egyptians, the latter could have drastic consequences because it makes the Church a part of the political regime. The ideals of human dignity, social justice, and human rights need to be integrated into Church discourse. Only by struggling for a political regime that respects these principles will the Copts, together with all Egyptians, receive their full social and political rights. In this and Fahmi’s other recommendations are found much wisdom. But where he wants to differentiate, I see simply a different involvement. To hold out a discourse for these values would be to very obviously criticize the current regime. Perhaps this prophetic voice is the burden of the gospel, but it is also very political. If the author wishes to accuse the church of hypocrisy for criticizing Morsi and not criticizing Sisi, let him do so. But the stakes for Christians were different, and as mentioned above, the church presented its approach in a national context, not one of religion or politics. The consequence of its decision, however, is to put the Muslim Brotherhood and Morsi supporters outside the national context. Indeed, Egypt’s Christians are convinced of the terrorist designation with which the government labels them. And Christians suffered much terrorism, as their churches were attacked by Morsi supporters across the nation. This is a high price to pay for the church, but the author comes very close to blaming the victim. This leads to a situation in which Church decisions can put the lives and property of any individual Copt at risk, even if he or she did not actually participate in making a political choice. The strategies of both the Muslim Brotherhood and the Church in this period have increased the level of religious polarization between Egyptian Muslims and Christians. The result has been a cycle of sectarian violence, with each side accusing the other of attacks on its followers. Unfortunately, this critique is partially true, but is it a cycle? The Brotherhood has certainly accused the church of a conspiracy, but their manner is deeply sectarian and propagandist. If the church had stayed silent, if Christians were not among the many, mostly Muslim activists who campaigned against the Muslim Brotherhood, perhaps they would not have been targeted. 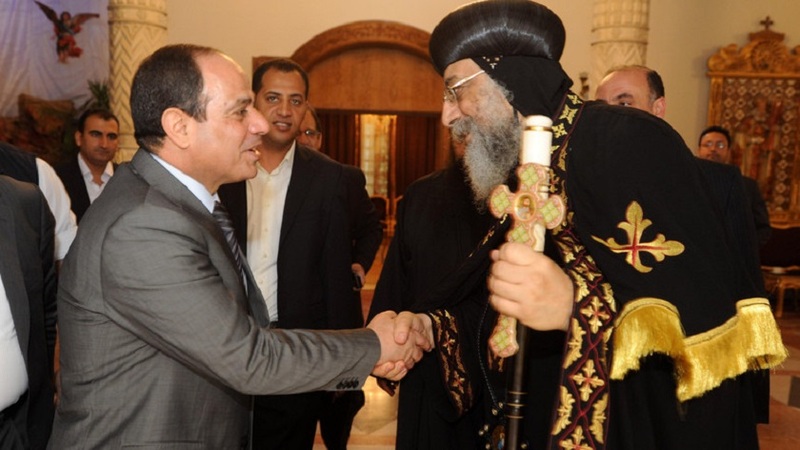 But did the church stand against Morsi for political gain only, to reset the Mubarak-Shenouda relationship? Or, did they place themselves in jeopardy because they thought it was right – for Coptic liberty, yes, but also for human rights and the good of the nation? If their intentions were true, which can be debated, then this is exactly the situation Fahmi calls for now, with the church defending universal values as part of its discourse. Many Muslims have spoken positively of the church, for what it has suffered, and many Copts appreciate that the bulk of ‘moderate Muslims’, as they call them, now see Christians in a different and better light. Like Fahmi, I can read into recent actions of the church a pattern of political engagement and representation of Copts as a community. I lean toward his perspective, wishing Copts as citizens would be in the forefront. But I try to watch carefully for evidence of this being the intention of the church, and I have not yet seen it. Fahmi links considerably to articles which trace history, but he can only interpret on this issue, and not link to any quotes. Certainly I have not seen the church discourage its people from their own participation in politics. If movements are faltering and parties are weak, is this not their own fault? They have had three years since the revolution to assert themselves, to build apparatus and win support on the street. They have not done so. If Sisi ignores them, as mentioned above, is it because they do not yet have sufficient weight to force their hand. The church does have weight. Fahmi’s correct question concerns how the church should wield it. The weight of the gospel does call for a prophetic voice, for self-limitation, and the promotion of the common good. Within the sharp political polarization and challenge to state authority, the church has a very difficult line to walk. The Coptic Church’s recent involvement in politics in Egypt has harmed both the Church and the country’s Christian community. If so, were he in Egypt, he would be one of the very few Christians to say so. Nearly everyone else is overwhelmingly positive about the status quo. Perhaps this is why his own prophetic voice, even in overstatement, is needed. May his readers in Egypt bristle, but also consider.